For the New Year I wanted to collect together some of the blog posts which have either inspired my posts over the last year, or that would be great follow up reading. In a few weeks, I will celebrate my first blog birthday, so this post is both a bouquet in the sense of a collection of different blooms, and a big THANK YOU bouquet to all my fellow bloggers and tweeters who have made this such a fun and inspiring year! I have used the same categories as my blog posts to organise these links, so that the connections are as clear as possible. Two blogs with great lesson ideas that can be used to supplement a coursebook or replace it. I love this post by Fiona Mauchline on Maccappella on the frequent problems with ‘personalised’ activities in coursebooks, and better ways to personalise. Kevin Stein’s blog is full of different ways of doing everything. Period (or full stop as we Brits say). I particularly liked this post, You can’t learn if you’re not awake. In this post, Kyle Smith shares a great idea for adding a tech twist to the coursebook grammar presentation. I love Ava Fruin’s thoughtful blog, Love is a better Teacher. For example, this post on Teaching a Multi-level Class. A great example of authentic reading materials as created by @JosetteLeBlanc’s student teachers. And there’s plenty of food for thought on the rest of the blog too. Great post on planning IELTS Part 1 graph questions from Sharon Turner’s EAP based blog. There are a lot of great resources HancockMcDonald, but one thread I’m particularly interested in is the relationship between listening and pronunciation. A thoughtful and well-informed blog, Luiz Otavio’s ELT Page has a subtitle of ‘thinking beyond the doing’; in other words he’s interested in why we do things, not just in what we do. This post is great at unpicking the process in planning a lesson with a grammar focus. Taking a slightly different tack, this is a blog post about one teacher’s (Mike Griffin) development in terms of planning, looking with great insight at the balance between ‘fun’ and learning and the impact of finding out about the dogme approach. In his blog, ELT Rants, REviews and Reflections, Mike always gives us plenty to think about. Also love Carol Goodey’s post on What I had planned, but not as I planned it. This post by Hugh Dellar on the Curse of Creativity, caused a lot of controversy (no doubt entirely intentional), but I really liked the way Hugh focused on the need to consider more than whether something is a fun or creative activity, and how creativity, while an important element, should not be the tail that wags the planning dog. I’m not a big fan of FE jargon- when I first started at an FE College in the late 90s, I managed to sit through a management meeting and understand virtually nothing because of the sheer number of impenetrable acronyms. So SMART targets isn’t something I personally find vvery helpful, and neither does Tony Gurr: Why SMART Goals are just plain dumb. Although Adrian Underhill is of course synonymous with pronunciation, I only came across his blog quite recently. Thoroughly recommended for both theory and practical ideas. Alex Grevett, aka @breathyvowel, doesn’t just write about pronunciation, but his blog features a number of interesting posts writing about the pronunciation based courses he runs. This is the most recent. Hard (impossible) to pick just one post from the wonderful A-Z of ELT, by Scott Thornbury, but this one is very relevant to speaking. I love all the DemandHigh posts, but this one on breaking the rules by not holding back on feedback until the end of a fluency activity is a particular recommendation. One of the things I really like about @pterolaur’s (Laura Phelps) blog, The Daily Ptefldactyl, is the descriptions of what is happening in her classroom. This post describes a lesson in which one of her teacher mentees in Borneo experimented with kind of ‘silent way’ approach. I’m not sure that Philip Kerr’s stuff gets mentioned enough. I thoroughly recommend his blog on wordlists (though he says it isn’t a blog!). At least a dozen great posts on vocabulary teaching. @muranava knows a lot about using corpora, and this post, How to explain a word using corpora, is a great, clear guide. 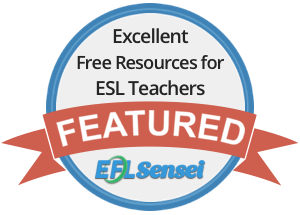 ELT Experiences is a very varied blog, with all kinds of content. This post on Using Dictionaries is my vocab related choice. Marisa Constantinides and her blog TEFLMatters probably need no introduction, but you may have missed this insightful post on group dynamics. I love pretty much everything on the IDTI website, but this post from Chuck Sandy, on Motivating our Students, struck a particular chord. Close up from @cerirhiannon. From a blog chockful with ideas, this is a great creative writing lesson plan. Chris Wilson is a prolific blogger and there is a lot of good stuff to explore on his blog, ELTSquared. This post on using wikis for process writing added a new dimension to the topic for me. I’m sure I will keep thinking of other people and posts I should have mentioned- so, if I do, I’ll just come back and add them! Thanks again, and Happy New Year. Thanks for posting it. Nice collection of posts and blogs! Rachel, first off I love the tulips. Just got finished reading about the bursting of the tulip bubble (inspired by a new house, a new table, and a vase full of yellow tulips) and have been inspired by your picture to find some multi-hued tulips if possible. Anyway, I love this collection of blogs. I’m worn out from New Years parties, but the links were just too good to stop reading. Especially happy to have found Philip Kerr’s (not) blog. Thanks for the mention of my blog, and very much looking forward to 2013. Thanks, Kevin. Tulips are my favourite..looking forward to spring! Hi Rachael. This is a great list of posts – many are ones I’ve missed, some are ones I’ll enjoy revisiting. I’m really pleased to be included. Thank you!!. I hadn’t realised your blog wasn’t yet a year old. It’s been a good year, with many useful and interesting posts. Congratulations! Thanks, Carol. It’ll be a year in February- kind of surprises me too! I think yours is a 2012 baby too? Lots of good stuff there as well. It’s been a fun (if busy) year. Wow! Took me a few days to get to this, but what a fantastic post, a great collection of blogs, and a nice reading list that will keep me happily occupied for at least a few days. Thanks, Rachael, and thanks for including me! This has really eased the job of having to do the rounds myself. Thanks for this great list. You’re welcome- was only planning on a dozen or so, but I kept thinking of more and more..and still left stuff out! First of all, happy nearly first birthday and congratulations on a great blog – over the past year I’ve enjoyed the way you combine practical ideas and theory, and on several occasions I’ve run off to class to try something out. Thanks for including allatc in your bouquet, and thanks for the reading list – a great collection of blogs and posts for some new(ish) year reading. Good to see that you’re enjoying blogging too much to stop! Thanks, Steve and there’s plenty on allatc.com to cause some running off to class to try things out! Many thanks for including my blog in your New Years’ bouquet. I feel really proud to be mentioned alongside some of the most influential ELT bloggers out there. Have been going through some of your earlier posts and keep seeing my name or links to my blog popping up. Thank you so much! I am glad we share similar views on language teaching. Now returning to your “bouquet”, although you categorise me as a Vocabulary blog 🙂 I want to try and blog more about grammar teaching this year – of course, approaching it from a lexical perspective. Thanks for commenting, Leo. As ever, I look forward to reading your posts!